Oscar has been handed a huge suspension for his part in the multi-man scuffle that brought a halt to Shanghau SIPG’s game against Guangzhou on Sunday. The Chinese Football Association (AFC) have deemed Oscar’s conduct worthy of an EIGHT-game suspension, couple with a fine of 40,000 yuan (around £4,600). 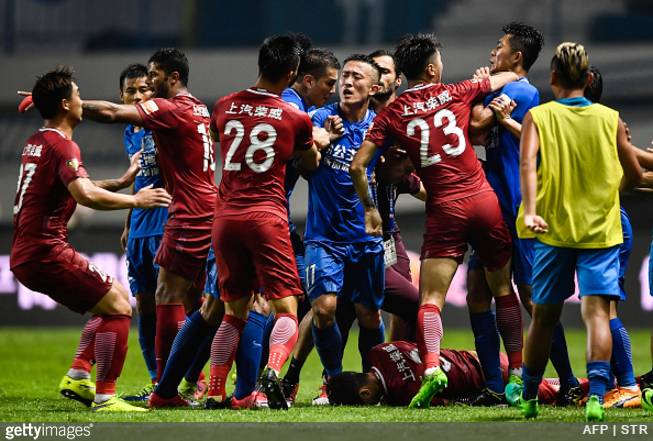 According to the referee’s report, video evidence and a written explanation from the parties involved, when the game reached the 45+2 minute SIPG player Oscar offended opposing players in an immoral manner, leading to a massive brawl which has had a very bad influence on the Chinese Super League’s reputation. The resulting ban means that the ex-Chelsea player will be unavailable for selection until mid-August. Who’d have thunk little ol’ Oscar would be moving to China as a hard-nosed midfield bad lad?